Owls are interesting birds. They are raptors. That means they catch other animals for food. Most owls are nocturnal. They hunt at night and roost during the day. They have special eyes that help them see at night because the pupil gets so big. Most owls are nocturnal. They hunt at night and roost during the day. They have special eyes that help them see at night because the pupil gets so big it covers most of the eye and lets in more light. Their eyes are bigger than most birds and take up more room in their head than their brain does. The owl has to turn its head to look from side to the side because it cannot roll its eyes. Owls can focus on objects both near and far at the same time. A great gray owl can see a mouse two football fields away. Owls also have a third eyelid which keeps the eye moist and helps protect the eye. 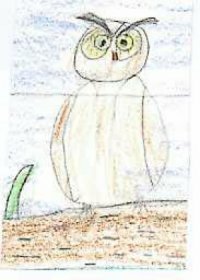 It seems like an owl doesnt have a neck but it does. It has fourteen bones in its neck. It can turn its head farther around than we can. It can look behinditself. Sometimes it seems to have its head on backward. It can also turn its face upside down. Owls have excellent hearing. They sit quietly on a tree branch and listen to find its prey. Some owls have one ear lower than the other. The right ear hears best from below and the left ear hears best from above. Most owls legs are covered with feathers.They have four strong toes, two point forward and two point backward to help it grab things. Sharp talons, or hooked claws, are at the end of each toe to help them hold their prey, or food, tightly. Owls usually swallow their food whole, headfirst. Their body cannot digest hair, feathers, or bones so this is regurgitated, or spit up, as small balls called pellets. These owl pellets can be fun to look through because you can see the bones of the animal the owl had for lunch. Most owls eat rodents, small mammals, snakes, insects, and small birds. We used to think of owls as our enemy but they are very helpful. They hunt mice and other pests and help make the world a better place. People are still their biggest enemy. We can help owls by saving places where they live. We can even make owl houses for some of the owls. We need to be careful using chemicals which can cause pollution. Many owls are killed by cars and by people with shotguns. If you find an injured owl or an owlet, a baby owl, do not touch it. Go away from it as you can and watch it for at least half an hour. If it is still is alone,get someone from an animal shelter who knows how to take care of it. They will call a rehabilitation center. This center will help the owl and return it to the wild when it is ready. This is the second largest owl in North America. It can grow to be about 25 inches tall and its wings can spread out to about 55 inches across. It is brown spotted but is darker brown on its back. It has white on its throat and has large yellow eyes. It gets its name from the ear tufts that stick up and look like little horns.They hunt many animals and birds - even skunks! They often use an old nest from a red-tailed hawk, crow, heron or eagle. This is usually high in a treetop. They lay 2-3 white eggs and the babies can fly 63-70 days after they hatch. They make a deep HOO! hoo-hoo hoo HOO-HOO! sound. This can sometimes be heard for more than a mile. They are common in the marsh but are hard to see. Crows hate them and will dive at them to pester them. If you see a lot of crows doing this, look carefully and you might see this owl. There are 31 different kinds of screech owls. The eastern screech owl can be reddish brown or gray. They are 7 - 10 inches tall and weigh about 7 ounces.When they spread out their wings they measure about 22 inches across. The eastern screech owl has ear tufts that look like ears but they are really feathers. The adults call is a trill like the whinny of a small horse and only the babies screech. It eats anything it can catch, mammals, birds, small reptiles, or insects. It nests in open woodlands, old orchards, cliff ledges and in tree holes. It lays 4 to 6 eggs. The babies fly in about 4 weeks. The barn owl is a cool bird. There are 9 species of barn owls. They get their names from living in barns. They dont hoot like other owls. Their call is a loud screaming shreeeee. 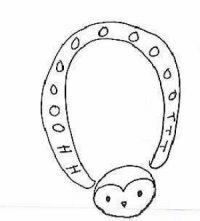 Their eyes are smaller than most owls and their ear openings are ovals instead of slits. This owl is13-15 inches tall and their wingspan is 41 to 45 inches. The female weighs 17 - 25 ounces and the male weighs 14 to 19 ounces. The barn owl is white, brown and has black spots. It has a heart-shaped face and sharp claws for gripping things and for catching animals. They like living alone and hunt alone in open fields.They can even dive into shallow water for fish. Its favorite food is small rodents but it will eat any small mammal. They are called one of Wisconsins best mousetraps. With less mice the farmers will have more grain. Sometimes they are blamed for taking poultry from the farmer. They take their prey, or food, to a special place to eat. chicks can fly when they are eight to ten weeks old. Baby barn owls are white. This owl lives in many different places in North America, South America, Southeast Asia, Africa, Europe, and Australia. They like warm climates with mild winters. Barn Owls can live to 3 - 4 years and the adults may migrate southward during the winter to warmer areas. The barred owl grows 16-24 inches tall. It has dark barring across its chest. It makes barking type hoots that sound like it says, "Who-cooks-for-you? Who-cooks-for-you-all?" They like to live in wooded swamps and dense forest. It lays 1 to 4 white eggs in an old crow or hawk nest or in a hole in a tree. The babies can fly 40 to 45 days after they hatch. 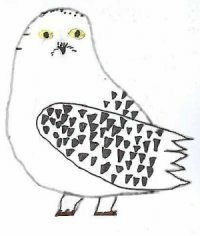 The snowy owl is sometimes a visitor to our marsh. It usually lives in the Arctic. 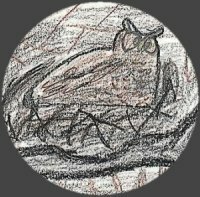 Owls, Owls, creepy at night! Owls, Owls, give you a fright! They like to fly around at night. You might see one fly on by.